ShopKeep offers a fast, customizable, and versatile register capable of accepting a variety of payment types along with a cloud-based back office for reliable and intelligent reporting. With ShopKeep you can expertly manage your inventory, identify top-selling, high-margin items, track your most productive employees, and stay on top of real-time sales with the ShopKeep Pocket mobile app. • Payroll and time management. • System sync so all registers instantly sync with back-office systems. • Customer marketing (email list integration with MailChimp) and easy customer tracking that allows you to track top customers by purchase, visits and purchases over any time period. • Gift card integration and loyalty program. • Mobile integration so you can check on your business no matter where you are. • Transaction features including tip integration, split merge or transfer checks as well as terminal drops and payouts for accurate cash handling and reporting. Also notable are ShopKeep’s features to help manage your small business operations. The employee reporting features let you maintain a watchful eye on employee productivity and sales, and the time clock feature can be used to monitor labor hours and payroll. There’s extensive integrations included that add to the power of your POS system, such as issuing and accepting gift cards and syncing your ShopKeep customer records to MailChimp’s email marketing platform. That integration alone will help boost direct customer engagement, improve lifetime customer value, and greatly increase the number of return customers to your business. Retail Businesses benefit from ShopKeep's stress-free inventory that makes managing stock keeping units (SKUs) easier than you'd expect. With detailed analytics you can easily know your top-selling items or which departments to expand. ShopKeep also offers hardware that retail businesses specifically benefit from, such as portable barcode scanners and barcode printers. Restaurants & bars use ShopKeep because of the customizable and intuitive iPad POS solution that allows you to move through transactions as quickly as possible, helping you serve more customers every day. Quick Serve use ShopKeep because of the customizable and intuitive iPad POS solution that allows you to move through transactions as quickly as possible, helping you serve more customers every day. With the tablet functionality, everything takes place with screen taps. That means seamless shift changeover and open and closing shifts with just a few screen taps. Transactions can also be handled easily with sales completed with just a few taps. There’s even note input for clarification on any transaction. ShopKeep gives you all the classic functionality you need in a POS system complete with wireless integration to make the entire process simpler and more efficient. ShopKeep offers stellar reporting that can be accessed from anywhere, including on your mobile phone, allowing managers a more delicate work/life balance. Because of the extended functionality, you can access real-time reporting on inventory and cost of goods, operations and sales, labor hours, tax reports and more. You can stay on top of cash flow and print out shift reports straight from any register, including X and Z reports for quick shift summaries and recaps. The application process is simple. ShopKeep offers a demo of the software so that you can see all the features and functionalities before purchasing. From there, you work with a sales rep to get a quote for your business, including software, hardware, and credit card processing. 7. Provide your contact information and Shopkeep will help you get setup in no time. It makes sense to split a review of ShopKeep into features for the front-end register and the BackOffice, because the platform is designed to help businesses run their entire setup – not just cash out customers. The front-end register offers a comprehensive feature list, allowing your staff to apply discounts, split and merge checks, and easily take a variety of customer payment options. There’s even multiple options for scanning and entering items including tapping selections from the screen, manual system searches, or barcode scanning. Thoughtful features cater to a range of business types. Retail stores will find ShopKeep’s items with variants feature extremely valuable, making it easy to select the right size, color, design or other variation when adding new inventory to the shop. Quick-serve businesses will see increased tips with the custom tip and signature screen on the iPad, along with rapid ordering to help speed up customer processing. The BackOffice features are especially impressive for a solution designed primarily for small to medium businesses with front of the house in mind. The system was designed to handle inventory, so the BackOffice system provides extensive and detailed inventory management, with zero limitation on the number of SKUs you can enter into the system. Combined with the product variants, your inventory is virtually limitless. ShopKeep also features backend functionality for reporting so you can see how your inventory is moving and being managed, including reports to view your best-selling products and set triggers (product threshold minimums) to get alerts when it’s time to order and restock. There’s even extended functionality for multi-site operations, including site-specific logins to make it painless to switch between stores in order to access and view respective reports. ShopKeep has built an operation that focuses on taking care of its customer. That focus has even won the company a Stevie Award for customer service 5 years in a row; the most recent being a Silver Stevie Award in 2018. The most compelling aspect of the customer support is that ShopKeep runs it 24/7/365 - around the clock. It takes into account that businesses operate at all hours, and that problems don’t typically show up when it’s convenient. That support is also available through multiple channels including phone, live chat, email, text, and online submission. All support services are available with the ShopKeep service plans. If you want Premium Care you’ll need to pay an additional fee of $30/month. If you prefer to find the information yourself, the support microsite provides a wealth of articles as well as video tutorials that cover every aspect of the ShopKeep platform. Whether back of the house or frontend services, you’ll find simple tutorials to help you learn and troubleshoot your system. ShopKeep also maintains a number of social channels including Facebook, Instagram, and Twitter. While these are primarily meant for social engagement, there’s always support available with shared content that links back to the ShopKeep blog. That blog, Small Business Hub, is a regularly updated collection of educational material to help small business owners thrive and grow their business. 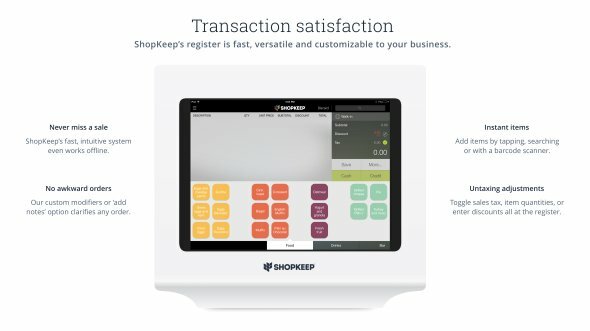 Some Point of Sale systems have complicated pricing or cancellation fees, but Shopkeep couldn’t be more transparent and straightforward. Enjoy the flexibility of month-to-month payments and a competitive rate tailored to the individual needs of your business. For payment processing, ShopKeep offers the lowest integrated rates via its in-house solution, Shopkeep Payments, but it is also able to work with practically any other processor of your choosing. A Shopkeep Point of Sale Specialist will be able to give you a customized rate for your specific business needs. You can take payments with multiple payment methods, from cash to card and mobile wallet options like Apple Pay. When it comes to hardware, ShopKeep has an extensive selection of competitively priced hardware and every piece is backed by a 1 year warranty that includes free delivery and returns within the US. It even includes some kits to help you get started, which start at around $900, and can come with or without an iPad. You won’t be required to sign a lock-in contract when you start using ShopKeep. The company provides the flexibility of simple month to month payment plans, providing small businesses with wiggle room for growth without the fear of long term contracts and huge cancellation fees. ShopKeep is great for small to medium sized businesses in the retail and quick-serve restaurant industries and offers a strong iPad and cloud-based POS solution. With an intuitive interface, easy-to-use register and great back office functionality, such as staff monitoring and in-depth inventory tools, it’s easy to see how it services over 25,000 businesses. ShopKeep syncs to the cloud, but also offers the majority of its functionality offline. We love that you can keep on top of your critical business metrics from the mobile app and can purchase starter kits which help you hit the ground running. ShopKeep is the point of sale system built by and for small business owners. ShopKeep is intuitive, easy to use, and quick to get started. It was founded by a merchant, so it knows that for busy business owners simple, powerful solutions beat complicated bells and whistles every time. With ShopKeep, you can accept any form of payment, plus you get essential features like automatic inventory tracking, employee management and real-time sales reporting anytime, anyplace. All for less than you pay for your daily coffee. And as your business grows, your ShopKeep system can grow with you – so you’re never paying for features you don’t use. No wonder ShopKeep is the #1 rated tablet-based point of sale system by both industry experts and merchants.